F&W's Julia Heffelfinger recently learned of a brilliant invention that will transform your turkey into a self-basting machine. It's called a basting blanket, and no, you don’t buy it from a SkyMall catalog. 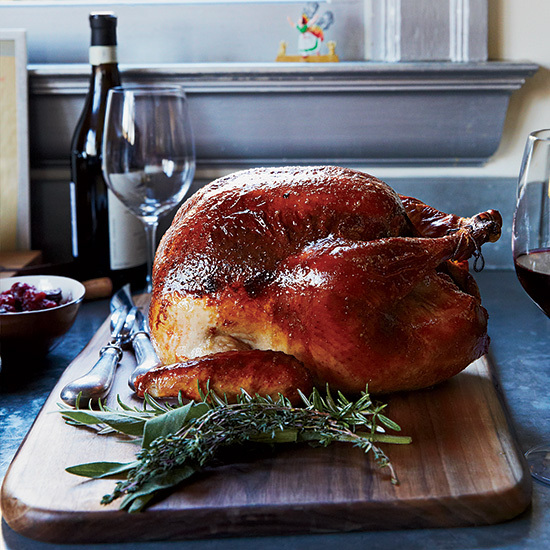 Basting is the key to deliciously juicy and flavorful Thanksgiving turkey—but who wants to baste it every 15 minutes when there are snacks to be eaten and pre-dinner cocktails to be drunk? The F&W Test Kitchen’s Julia Heffelfinger recently learned of a brilliant invention from Michael Symon that will transform your turkey into a self-basting machine. It's called a basting blanket, and no, you don’t buy it from a SkyMall catalog. Here, Julia reveals how to make your own and the best way to use it. Begin by melting butter (about a stick) in a medium saucepan over moderate heat. To the butter, add 3 to 4 cups of chicken or turkey stock and aromatics like onion, garlic, fennel, citrus peel, fresh herbs and spices. Bring the liquid to a simmer and cook for about 10 minutes to let the flavors develop. Remove the saucepan from the heat and let cool to room temperature. When cooled, immerse a large double layer of cheesecloth into the basting liquid. Set your turkey on a rack in a large roasting pan and drape the cheesecloth over the top of the bird (make sure the entire breast and legs are covered). Pour the remaining liquid over the bird and arrange the vegetables and aromatics around the base of the roasting pan (this will flavor your drippings and give you AMAZING gravy). Transfer your turkey to the oven and roast, carefully removing the cheesecloth for the last 10 to 15 minutes of cooking time to let the skin finish browning.